Now that “Fall Day” has ushered in autumn, and we hopefully won’t see 90 degrees again until 2018, the time has come to look ahead to winter. Specifically, we want to look at the impact a potential La Niña could have on Texas. The Climate Prediction Center recently issued a La Niña watch, giving the Northern Hemisphere a 55 to 65 percent chance of experiencing cooler than average waters in the eastern Pacific Ocean. Let’s take a step back however, and discuss what La Niña is, and how it could influence our weather in the coming months. El Niño and La Niña are the warming and cooling phases of water in the eastern Pacific Ocean, off the coast of equatorial South America. El Niño occurs when the water is warmer than usual, La Niña when the water is cooler than usual. The changes aren’t radical—just 0.5-4°C either way. However, that type of change, over such a wide swath of ocean, has a massive impact on the global climate. It’s a classic example of the butterfly effect. A seemingly small change in another part of the world results in big impacts everywhere else. As of the last update, surface ocean temperatures off the coast of Peru are between 0.5°C and 3°C below normal. The longer this pattern persists, the more likely La Niña will impact the globe. While the sea temperatures often oscillate unpredictably every few years, we can (somewhat) accurately predict what will happen during an El Niño or La Niña year. Since La Niña lies in our forecast, we’ll focus on it. 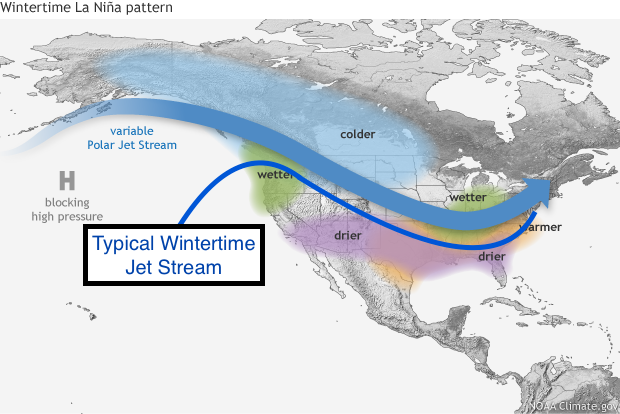 La Niña’s largest impact lies in how it affects the jet stream. I’ve discussed in the past the mechanics of the jet stream, and how important it is to Texas weather. In a normal winter, the jet stream drives low pressure systems and cold fronts down from Canada and into the southern United States. La Niña limits the southern extent of the jet stream, minimizing the number and intensity of those cold, rain-laden fronts we typically see. This means Texas could see a drier, warmer winter than average, if typical La Niña patterns play out. The Climate Prediction Center’s seasonal outlook reflects potential La Niña impacts. The maps below show temperature and precipitation probability for the remainder of 2017. This product shows above average temperatures forecast for most of the lower 48, and below normal precipitation probability for Texas and the southeast. It also shows an above normal precipitation probability for the Pacific Northwest. If you compare the maps below to the diagram above, you can see a near-perfect correlation between what typically happens in a La Niña, and what is forecast. Finally, a caveat. La Niña forecasts, like many things in meteorology, are a prediction. Our winter could range from very dry and very mild, to something that looks totally normal. For example, Californians were very excited to see a strong El Niño form in the Pacific in 2014-2015–it potentially meant drought-busting wintertime rains. However, that result did not pan out, and the drought persisted. Come the springtime, we’ll take a second look at the La Niña’s impact on Texas, and compare it to the forecasts. Stay tuned! Does that mean that we are more likely to see hurricanes with El Nino and less likely with La Nina? Generally, La Niña means less wind shear and more atmospheric instability in the Atlantic, so conditions are more favorable for tropical activity. The Pacific coast sees fewer hurricanes. During El Niño, there is more wind shear and more stable air in the Atlantic, so fewer hurricanes…but more in the Pacific. Sorry to rant, I am a native Houstonian and would love to see some COLD weather here for a change…LOL. Kathy–I would but my entire family is here and we are very close! I just cannot believe this awful warm weather for winter. What is really going on??? It is weird. I can remember winters when I was a kid and they were cool-cold. Feel the same way. Born and raised here in Texas and I can’t stand it. Once my kid is 18, I’ll be looking to move somewhere with actual seasons. That freeze killed my beautiful grapefruit tree. Looks like I need to move if I ever want to have a winter again. Even a 50 degree high winter. I track forecasts for a local natural gas distributor. Last winter was historically warm (only 670 heating degree days from November 1 to March 31. An average winter is 1300 or so). Do you foresee anything that mild? I had the A/C running Christmas Day and a good part of last “winter”. I would hardly call that “mild”. It was getting downright hot! I thought “historically warm” had captured that euphemistically. I would be cautious saying this winter would be that mild. This La Niña, if it pans out, should be on the weaker side. Last winters was weak too. Only -.8 degrees below average according to sources. Last winter was identified as a weak La Nina as well, with average temp down 0.8 degrees, yet the warmest winter in Houston recorded history. I know they are all different, but that can’t repeat, can it? Can’t believe I am saying this but…Rain, I need Rain!!!! Drying up into dust and dead thingshere near Kingwood. Only 1″ since Harvey deluged everyone. I can’t take another winter like last winter. I’ve lived here for all 39 years of my life and I feel like each year the weather gets worse and worse. I need cold. 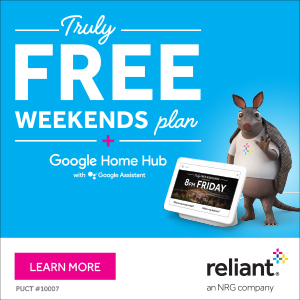 I love Houston, but I want to leave. I can’t handle this anymore. This is hell. I know how you feel, Torrence. I’ve been here 36 years since graduating college. Houston has been great for my career, but the summers are getting increasingly unbearable. The winters don’t feel like winter, anymore they feel like summer. Even though I didn’t flood, Harvey broke the camel’s back for me. I never, EVER wan’t to be pacing around the house by myself at 2 AM wondering if my house is going to flood or not. It’s bad enough in my late 50s, I can’t see doing it again at 65 or 70. It’s getting to be time to be within a couple of hours drive of family. The only question is when can I pull the trigger. I also grew up in south Texas and remember very cold winters. What is going on?? I think ya’ll should do a story on that. I just wish it would get colder like it use to back in the day. I feel the same, having grown up in Houston. I can take the occasional (?) hurricane/flooding, but I am weary of the warming winters. Will I ever wear a scarf in this town again?